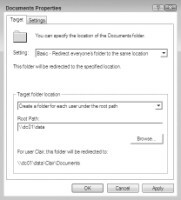 You can set up Folder Redirection in Windows systems by using Group Policy Objects. Learn how GPOs can accomplish this task in Basic Redirected Folders. The following are excerpts from chapter three of Jeremy Moskowitz's book, "Creating the Secure Managed Desktop." Learn more about Group Policy and Jeremy's Group Policy hand-on workshops at www.GPanswers.com/workshop. Now that the share is created, we're ready to create a new GPO to do the magic. Again, you'll want to do this on your Windows Vista management station, VISTAMANGEMENT. This machine should have Windows Vista + SP1 + the RSAT tools, which contain GPMC 2.0. For more information see the Introduction to this book for a lab setup guide. 1. In the GPMC, right-click the OU on which you want to apply Folder Redirection (in my case, the LikeUsers OU), and choose "Create a GPO in this domain, and Link it here." 2. Name the GPO, say, "Documents Folder Redirection," as shown in Figure 3.4. FIGURE 3.4 The LikeUsers OU has a GPO named "Documents Folder Redirection." After drilling down into the folder that you want to redirect, right-click and choose Properties. 3. Right-click the new GPO, and choose Edit from the shortcut menu to open the Group Policy Management Editor. 4. 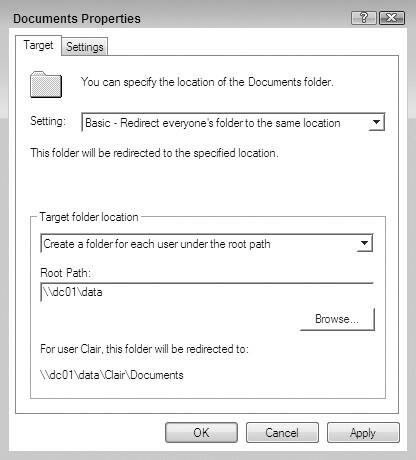 Drill down to Folder Redirection by choosing User Configuration _ Policies _ Windows Settings _ Folder Redirection. 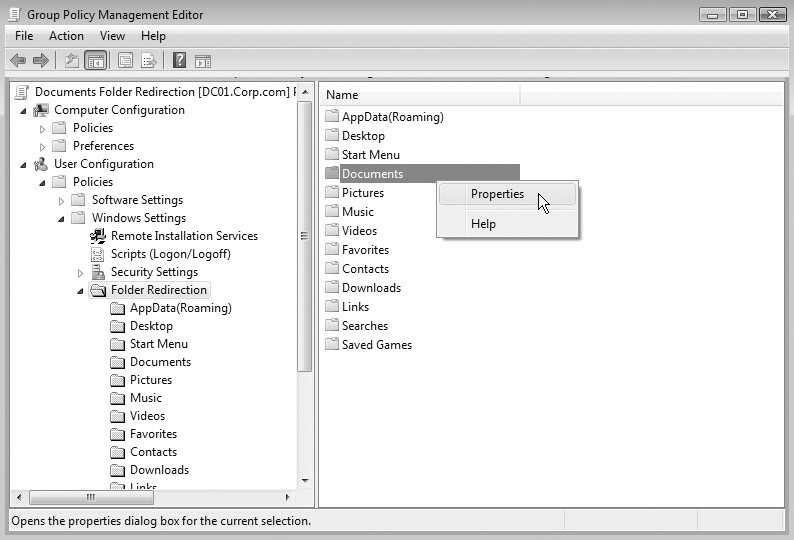 Right-click the Documents entry in the Group Policy Management Editor, and choose Properties to open the Documents Properties dialog box, as shown in Figure 3.5. 5. In the Setting drop-down list box, select "Basic -- Redirect everyone's folder to the same location." The Basic settings redirect all users in the OU to the same location. Don't click OK (or Apply) yet. There's more to do. If you do click OK or Apply, you're going to get a warning. Read other excerpts from Jeremy Moskowitz's book, Creating the Secure Managed Desktop.